Love coffee but hate the caffeine crash? Bing Han’s uniquely delicious Ginseng Coffee can give you healthier, longer lasting energy than regular coffee. And right now, there’s a simple way to try it! Enter Bing Han’s Ginseng Coffee Give-Away by LIKING our Facebook post and leaving a COMMENT on it about what you would do today if you had extra energy. 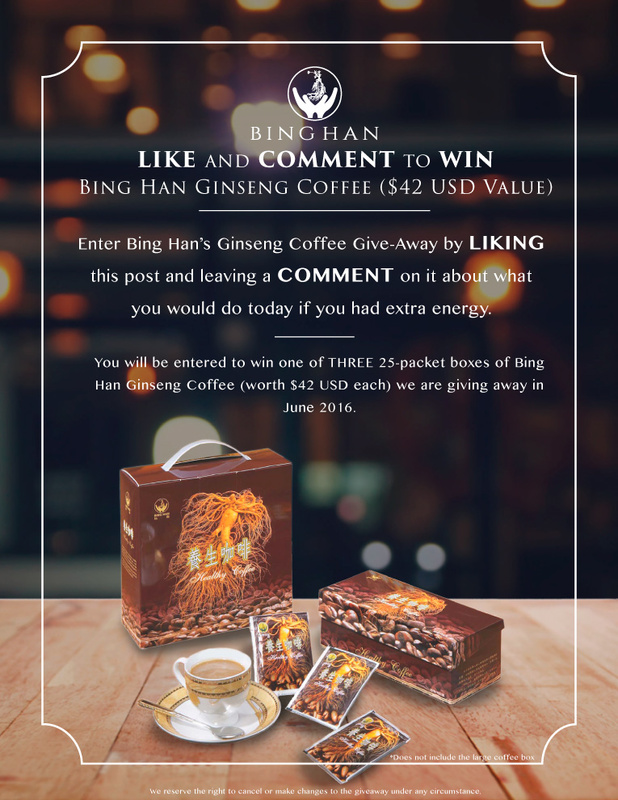 You will be entered to win one of THREE 25-packet boxes of Bing Han Ginseng Coffee, valued at $42 USD each. We will collect entries until May 31, 2016. If you are one of the winners, you will see your name appear on June 1 in the comment section of this post and we will also message you privately. We can ship the coffee to you for free if you live anywhere in North America. Remember to LIKE Bing Han’s Facebook page and SHARE the post if you want to see more giveaways like this in the future!